CHECK OUT OUR OTHER VINTAGE WATCH, JEWELRY, STERLING & ESTATE AUCTIONS! 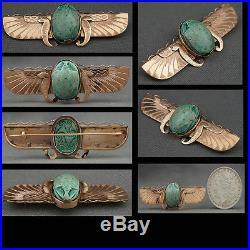 Phenomenal, vintage, solid 14K rose gold and faience scarab, Egyptian revival, estate pin, brooch in excellent original condition. Extremely high quality and expertly handcrafted, piece circa 1950s. 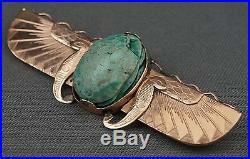 This vintage, mid-century brooch, is artistically made of high-polished, solid 14K rose gold, with finely detailed wings and a cobra on either side of a 22mm X 15mm, turquoise/green faience scarab. The craftsmanship of this brooch is of the highest quality found in vintage pieces, rarely found today. Words can not do justice to this work of art, so please view the photographs below to see what words can not adequately describe. An incredible statement when worn on any jacket or blouse. Original, solid 14K rose gold pin-back. An exceptional acquisition for the most discerning vintage jewelry lover and pin collector alike. The brooch is of large proportions, with a wingspan of over 2 3/4" (70mm), and is over 1" (25.5mm) wide in the center. Weighs 14.4 grams nearly 1/2 Troy oz. Arrives in an attractive gift box. All items carefully described to the best of our ability. We usually respond to emails within 24 hours. A NOTE ABOUT GOLD CONTENT: We are long established professional jewelers. Whenever a claim is made as to metal content or karat purity, it has been verified by jeweler's hallmarks or tested to industry standards. We unconditionally guarantee the content stated in our descriptions. We will specify if an item is not solid gold. Express service available at additional cost. Actual rates are based on the final cost of the item. We do not mark merchandise values below value or mark items as "gifts" - US and International government regulations prohibit such behavior. Don't be skeptical of our no reserve auctions. Occasionally we set modest reserves that are based in reality. We know you will love our items and our service. If you are not satisfied for any reason, please let us know so that we may work with you to make you happy. 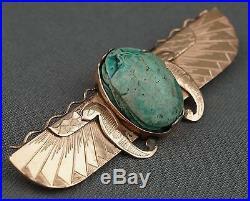 The item "Vintage 1950s Egyptian Revival 14K Rose Gold Winged Faience Scarab Pin Brooch" is in sale since Wednesday, December 24, 2014. This item is in the category "Jewelry & Watches\Vintage & Antique Jewelry\Fine\Retro, Vintage 1930s-1980s\Pins, Brooches". The seller is "oldetown" and is located in Santa Rosa, California. This item can be shipped worldwide.